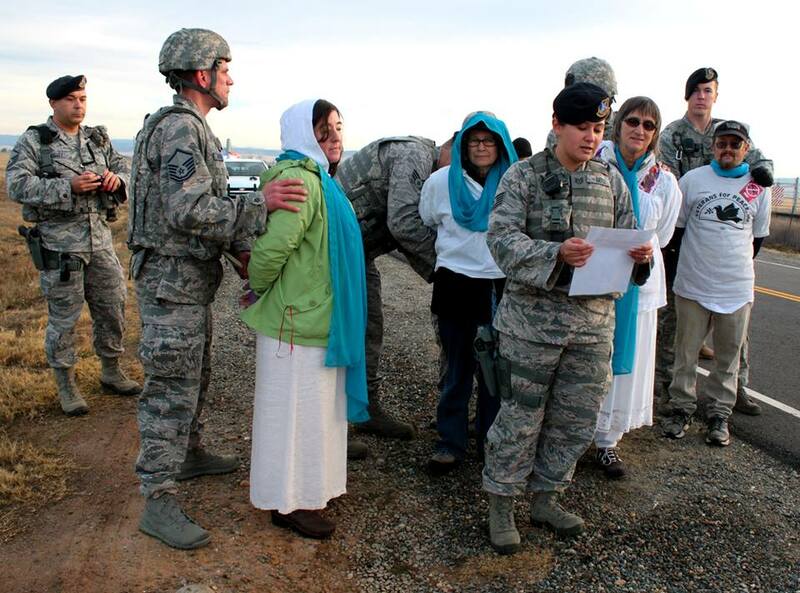 A Grass Valley, California resident was arrested at Beale Air Force Base Tuesday and cited for trespassing as part of a protest against the U.S. military use of drones — a scenario that almost landed her in federal prison following a similar protest nearly a year ago. “We are concerned with the role Beale is playing in murdering people,” said Shirley Osgood, who was part of a group of five protesters arrested for trespassing at Beale in October 2012 and ultimately sentenced in September to 10 hours of community service in a Sacramento federal court. Anti-drone advocates had kept an eye on that trial as Osgood, along with fellow Nevada County resident Sharon Delgado, faced up to six months in federal prison for trespassing charges. “We believe they are complicit, by the sharing of information, in the killing of civilians,” Osgood said, noting that Beale’s drone duties only include recognizance, not bombings. Osgood, along with a group of other protesters, started early Tuesday by blocking traffic into Beale by standing in the roadway and carrying banners, Osgood said. After about 30 minutes, Osgood and three others tried to enter the base to deliver a letter to Col. Phil Stewart, the Ninth Reconnaissance Wing commander. A Beale spokesperson, Lt. Siobhan Bennett, confirmed that four individuals were detained and ticketed for trespassing Tuesday. No fines were levied because the charges will be brought to trial, Bennett said. “We respect the rights of individuals to exercise free speech, and the United States Air Force has always been and continues to be committed to defending lawful freedom of expression guaranteed by the First Amendment to the Constitution,” said Stewart in an email Tuesday.